Origin and Habitat: Euphorbia schubei occurs in Tanzania (except coastal and South East regions). Occasional in Kenya (Ol Ari Nyiro Ranch and the Mukutan Gorge, Laikipia). Type locality: Tanzania, Iringa District. Altitude range: 800 - 1500 metres above sea level. Habitat and ecology. Euphorbia schubei grows amongst the undergrowth in grassy openings in rocky deciduous woodland. 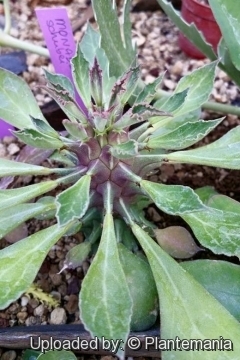 Description: Euphorbia schubei, best known as Monadenium schubei, is a perennial shrubby succulent herb, that branches mostly from the base and forms large mats with time. The stems are stout to 5 cm thick, erect sometimes to nearly 1 m high or reclining on the ground but with ascending apex. These are covered with prominent tubercles, each crowned by a cluster of 5 tiny spines at the base of minutely hairy leaves and producing in their axils cymes with pink-rimmed cyathia (flowers) enclosed by pinkish grey bracts. 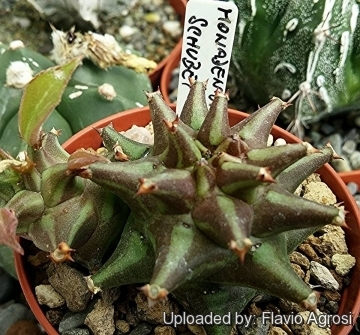 Derivation of specific name: This member of the Euphorbiaceae family was given this name for Dr. Theodor Schube (1860– 1934), German botanist and high school teacher. Schube's Euphorbia. 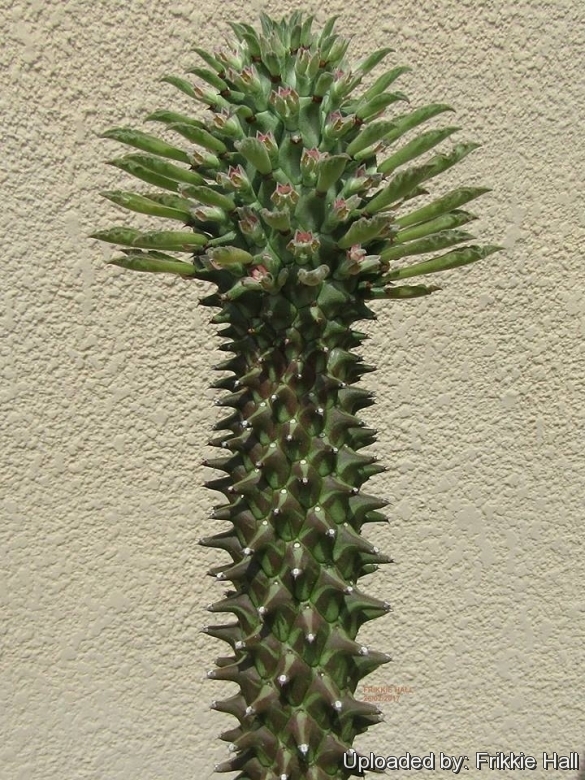 Stems: Several, stout, cylindrical, fleshy, erect 45-90 cm tall or decumbent, (1-)3-5 cm in diameter, tessellated with very prominent cylindrical-conical podaria (tubercles) supporting the leaves. Tubercles angular about 15 mm at the base and to 1 cm high, in usually 8 spiralled series, dark bluish green, often stripped in purple in full sun. Each tubercle bears 5(-6) persistent, very short (to 2 mm long), stout radiating spines (hardened stipules) at its apex, from a horny pad surrounding the base of the leaf-scar. 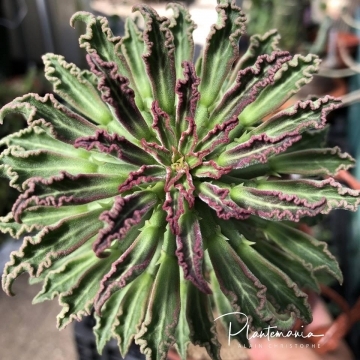 Leaves: Obovate, spathulate, acute, tapering to the base 3.5-8 cm long, and 2-5 cm wide with a winged petiole to 1.5 cm long, puberulous, sometimes edged and streaked with red. Margins entire, crisped on young crisped-crenulate, apex obtuse and apiculate. Stipules spiny, to 2 mm, clustered. Inflorescences (cymes): 1- to 2-forked produced the axils of the tubercles and occasionally with a small spine. Peduncles stout to 6 mm long. Bracts-cup about 7 x 6 mm, slightly exceeding the involucre, greyish-green flushed pink on the rims, lobes acute. 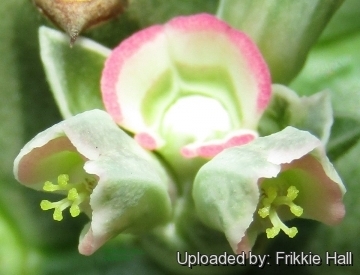 Flowers (Cyathia): Approx.5 x 4.5 mm, with cup-shaped involucres. Nectar-gland rim 2.2 mm, pink. Glandular rim 2.2 mm high, deep pink. Lobes rounded, approx. 1 x 1 mm. Male flowers: Bracteoles laciniate, puberulous; stamens 2.8 mm Long. 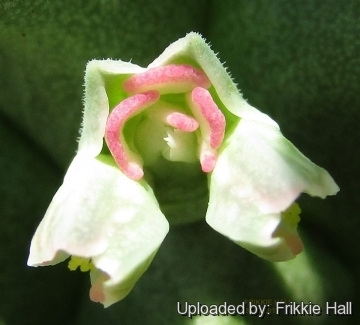 Female flowers: Ovary with evident perianth as a 3-lobed rim below the capsule ± 3 mm in diameter. Styles 2 mm long, joined at the base, with thickened bifid apices. Fruits: Acutely lobed, approx. 6 x 8 mm, with narrow fleshy crenulate ridges. Pedicels stout 4 mm long. Seeds: Oblong, 3.2 x 2 mm, minutely tuberculate, caruncle present. Cultivation and Propagation: On the whole Monadenium schubei adapts to cultivation without much difficulty. They must be grown very hard in the nursery as close to the natural conditions as possible. This ensures that they keep their compact habit. Growing rate: It is a moderately fast grower, and will quickly become large masterpieces in just a few years. Light: It can tolerate moderate shade, and a plant that has been growing in shade should be slowly hardened off before placing it in full sun as the plant will be severely scorched if moved too suddenly from shade into sun. Soil: Generally, any quick-draining succulent soil mix will suit it. In pots give the plant an airy growing medium which mainly consists of non organic material such us clay, pumice, lava grit, and only a little peat or leaf-mould. Repotting: It like quite small pots, repot in very later winter, early spring. Waterings: The sausage-like stem will do well will take a reasonable amount of water in hot weather, when they grow (about once a week). It needs to be kept drier in winter (when the leaves drop) and whenever not growing actively. However, this species seems to hate being wet for any extended period, and can rot easily (especially in winter) if overwatered. Hardiness: Due to its African origin, it cannot tolerate freezing temperatures, and should be protected from cold (but should be able to handle 7 degrees C very easily). Traditional uses: Monadenium schubei latex, mixed with food, is used by the Pare in Tanzania as a mild purgative.